For the second time since Friday, an armed robber has targeted men working on multi-million dollar new home construction in the North Center neighborhood. And detectives are investigating the attempted sexual assault of an agent who was trying to sell a $1.6 million home nearby. Police believe the two robberies are related to a third construction crew hold-up in Wicker Park. Around 5 p.m. today, two construction workers told police that an armed man entered the $3.2 million home that’s under construction at 3750 North Hoyne and forced them to hand over phones and wallets. The gunman then fled out the back door where another man appeared to be waiting for him, the victims said. Rendering of mansion/crime scene where the gunman struck today. Police say the offender is a 30-year-old Hispanic man who stands about 5’7” tall and weighs about 160 pounds. He wore a green hoodie and displayed a silver semi-automatic handgun. 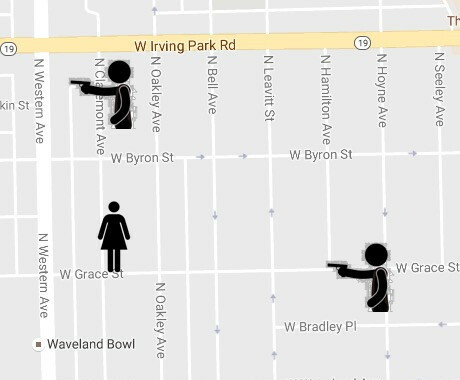 Also Friday morning, a construction worker was robbed at gunpoint while working on a new home in the 1400 block of North Oakley in Wicker Park. Again, the gunman is a Hispanic man in his 30’ who wore a hoodie. Detectives are also investigating the attempted criminal sexual assault of a real estate agent in the 3800 block of North Claremont on October 1. The woman told police that she was showing the home when a man posing as a construction worker entered the home and fondled her. She described the offender as a white man, about 5’8” tall, and wearing a red baseball cap with a green jacket and jeans.